Joyetech eCom Leather Case is a new type of leather case dedicated to eCom vape kit. 2 specially designed apertures for power button and USB port. 2 selections: eCom 650mAh and 1000mAh batteries. Joyetech eCom Leather Case is a new type of leather case dedicated to eCom kit. Exquisitely designed and finely fabricated, eCom leather case is endowed with smart appearance and decent texture. More importantly, it is not only pretty but also handy. Leather cover can protect eCom against abrasion and impression, and the design of necklace makes it convenient to carry and use. • Two types of leather cases are available for your option: 650mAh and 1000mAh. 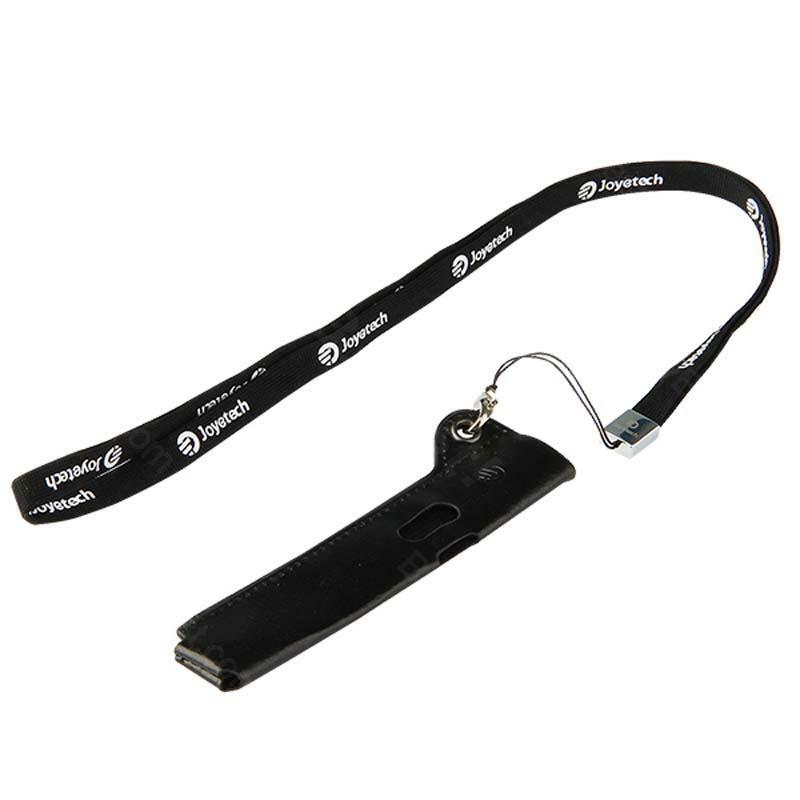 • There are Joyetech logos printed on both sides of the lanyard and on the leather case. t's almost a great product, but for me it's a good product with what would take just a minor tweak that would make it great. The fit and function of it are great. The only downfall in my opinion is the loop for the clip. It either needs to be turned 90 degrees or they need to have a swivel clip so it lays against me properly when hooking it to my belt loop. I was lucky enough to find a swivel clip that I used in conjunction with the original clip and it works much better for me. Overall it's a great product. I just had to take a star for it not being comfortable to clip to my belt loop. Here's a couple pics of my modified version. This allows it to lay flat and be a little more accessible. This item is made very well however there is a slight design flaw. The way how the pouch opens will eventually (through continuous use) cause the leather to tear on the fold line [yellow]. There are little holes [red] made to prevent this however. I think that it would have been better if two stitches [green] were placed above or on the end of the cut to add strength or to have the lid sewn on instead of having it as one piece. This is my second one. I already have nicks and scratches all over this case from dropping my phone over and over, but they barely show. They just give it a more character - as someone once told me. Not a scratch on the part it protects; my phone. It is not waterproof though. Had it in my back pocket the other day and it did stain the case on one corner. Note: when this case arrived, I thought it was plastic. If you give it the smell test, you will find it is not plastic, it just has a good finish. Брал для отца. Так как у самого есть около 20-ти разнообразных баков и дрипок давно пытался склонить папу на сторону пара. От всех моих устройств у папы при парении был кашель и без разницы давал отцу баки с сигаретной и кальянной затяжкой. Жидкость использовал 70 на 30 и 60 на 40 с никотином от 4.5 до 20.Это первый набор который не вызвал кашель у отца. Очень маленький и лёгкий. Летом можно даже положить в карман тениски. Сейчас папа пользуется жидкостью 60 на 40 и никотин 20. Рекомендую к покупке как походный девайс и для перехода с аналоговых сигарет. Joyetech Leather Case has top quality. Satisfied. Joyetech Leather Case for is a new type of leather case dedicated to eCom kit. Exquisitely designed and finely fabricated, this eCom leather case is endowed with smart apparance and a good grip. Joyetech Leather Case made of high quality leather for eCom Kit is a new type of leather case dedicated to eCom kit. Exquisitely designed and finely fabricated, this eCom leather case is endowed with smart apparance and a good grip. Joyetech Leather Case for e Com Kit is a new type of leather case dedicated to eCom kit. Exquisitely designed and finely fabricated, this eCom leather case is endowed with smart apparance and a good grip. Joyetech Leather Case for eCom is a new type of leather case dedicated to eCom kit. Exquisitely designed and finely fabricated, this eCom leather case is endowed with smart apparance and a good grip. Joyetech Leather Case is a new type of leather case dedicated to eCom kit. Exquisitely designed and finely fabricated, this eCom leather case is endowed with smart apparance and a good grip. The ring doesnt fit the evod. The pouch fits nicely and the little slit for the button is the correct length (though barely). Only complaint is that if you squeeze the sides of the pouch it causes slack and loses its grip on the ecig. Not a big deal if you plan on wearing the lanyard around, like I do. Joyetech Leather Case is a leather case for eCom Kit is a new type of leather case dedicated to eCom kit. Exquisitely designed and finely fabricated, this eCom leather case is endowed with smart apparance and a good grip.